Unlike other years, this summer has been a very busy one. However, I spent my time doing something that I love, RESEARCH. 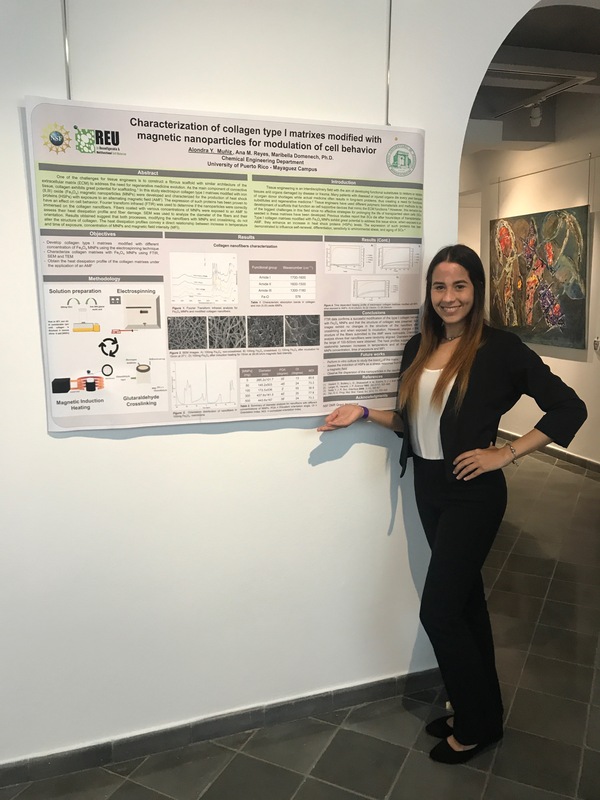 As I mentioned in my previous blog, this SUMMER2017 I got the opportunity to be part of the REU in Reconfigurable and Multifunctional Soft Materials at the University of Puerto Rico-Mayagüez Campus. My research was focused in the development and characterization of type I collagen membranes modified with magnetite (Fe3O4) nanoparticles for modulation of cell behavior. These modified membranes are of interest because when exposed to an alternating magnetic field, they enhance an increase in heat shock proteins. The expression of such proteins has been proven to influence stem cell behavior. Thus, membranes with different concentration of magnetic nanoparticles (MNPs) were developed by the electrospinning technique. Glutaraldehyde crosslinking was performed to the membranes to obtain water insoluble nanofibers by increasing fiber yield and resistance to stress. Fibers coated with various concentrations of MNPs were exposed to an alternating magnetic field to assess their heat dissipation profile and fiber damage. On the analytic part, Fourier transform infrared was used to determine if the nanoparticles were correctly immersed on the collagen nanofibers and to address any changes in the chemical structure of collagen after both modifying the nanofibers with MNPs and crosslinking. Scanning electron microscopy and ImageJ plug-ins, DiameterJ and OrientationJ, were used to analyze the diameter of the fibers and their orientation. Results obtained for the heat dissipation profiles convey a direct relationship between increase in temperature and time of exposure, concentration of MNPs and magnetic field strength. FTIR data confirms a successful modification of the type I collagen matrixes with Fe3O4 MNPs and that the structure of collagen was preserved after both crosslinking and the modification of the nanofibers.Orientation analysis shows that nanofibers were non-aligned or randomly oriented. Diameters between the range of 100-500nm were obtained. Results obtained were promising, still, a ton of more research needs to be done. Future works include studying the toxicity of the matrix and evaluating the expression of heat shock proteins as a response from magnetic fluid hyperthermia. Besides the research part, we have had a lot of fun in the many recreational activities coordinated by the staff of the REU program. I will take many beautiful memories from this experience. We are a very diverse group but with one same passion, for sure. I can genuinely say that this experience has been enriching in both professional and sociocultural aspects.